Installing a window air conditioner in a double-hung window is an easy job that should take less than an hour in most situations. The steps given here are meant to serve as a general guide. Window-mounted air conditioning unit is easy to install in a double-hung window. Side flaps accordian out to fill the opening. Various brands of window air conditioners have differing attachment methods. New window air conditioners are packaged with manufacturer’s instructions for installation—be sure to follow these directions. If you attach a unit improperly, it could fall. Measure the size of the opening to make sure the unit will fit. 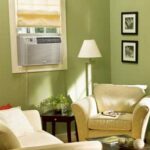 See Sizing a Room Air Conditioner for information about sizing the unit. The best type of window for receiving a window air conditioner is a double-hung window that can be opened at the bottom. The AC unit will need to be plugged into an electrical outlet that can supply the necessary current without overloading the circuit. 1Completely open the bottom sash of the window, remove the window screen if there is one, and clean the sill and channels with a vacuum. 2Prepare the extensions. 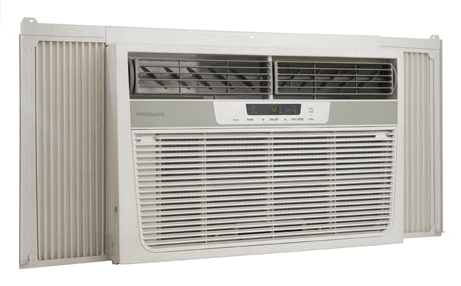 Most AC units have accordion or sliding extensions that slide to completely fill the opening. Some units have these already attached; with other models, you’ll need to slide them into channels on the side of the air conditioner. It’s best to prepare these before putting the AC unit in the window opening. 3Prepare mounting brackets. Some AC units simply sit on the windowsill; others rest on special brackets that attach to the sill. If you unit utilizes mounting brackets, install these brackets according to the manufacturer’s instructions. Be sure to level the unit according to the recommendations (typically with a slight downward slope toward the outdoors to allow for drainage of condensation). Make sure the fasteners are secure. Some units come with two lengths of weatherstripping foam—one goes along the sill beneath the unit, which you can put in place now. The other will go on top of the unit once it is installed. 4With a helper if necessary, lift the AC unit. Use your legs, not your back muscles! Slide it into the window opening from inside the room, positioning it properly on the sill or support brackets and, if using brackets, lock it into place on the brackets. Be careful with this step—don’t let the unit fall out the window! If your air conditioner has a drainage hose, route this to the outside. 5Lower the window sash so that it fits snugly into the channel on top of the unit. The mounting flange at the top of the unit should be flat against the lower window sash. Slide the accordion extensions to fill the opening and fasten them to the jamb. 6Seal the inner perimeter of the opening with foam weatherstripping (often provided). Caulk around the outer perimeter. 7Plug-in the AC unit and enjoy the cool! If the plug has a reset button, check it by pressing the button to see if it shuts off the power.